You crash land on a hostile alien planet with just two companions, a Labrador, and a sharp stick for company – so what next? When it comes to the indie scene, there are few titles with quite such a loyal fanbase, extensive modding community, and dedicated designer as Rimworld – and that’s all even before the release of this western space simulator game, set to launch officially in late 2018. First unveiled in mid-2013 as a slightly under-polished addition to the simulation genre – and bearing a striking homage to the earlier beloved title Dwarf Fortress – Rimworld is one of those indie gems that you discover one day by accident. And, if you’re anything like me, you soon rack up hundreds to thousands of hours playing, without even getting into the late to end-game. 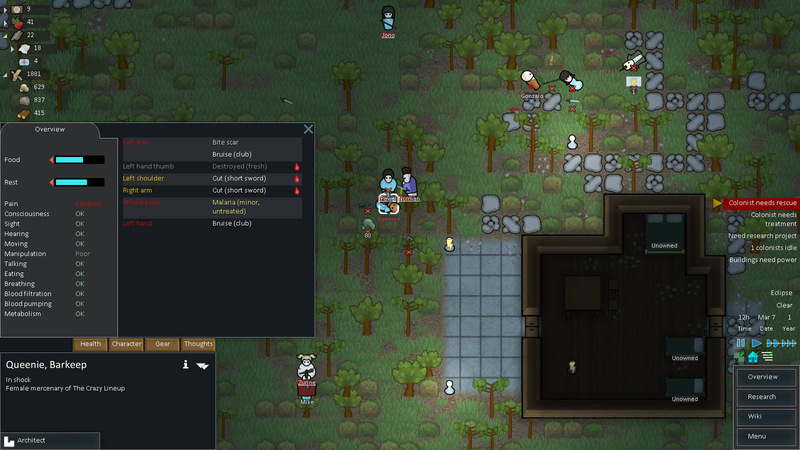 Officially titled as a ‘Sci-Fi Colony Sim’, the basis of the Rimworld experience is the typical rags-to-riches simulation adventure with a twist. Set in the far-off future following humanity’s colonisation of space, and with direct inspiration to space western series Firefly as well as epics like Dune and Warhammer 40k. How do you play Rimworld? There are many different ways you can play Rimworld, depending on your choice of behaviors, the level of difficulty you choose or your commitment to min/maxing your way to the end. Rather than standard difficulty settings ranging from easy to severe, this game shakes things up in a big when it comes to picking how your game is going to play out. Before you can choose your actual level of difficulty, which can range from a true sandbox to a hellish nightmare with waves of enemies coming at you from all side, you have to select from several different AI ‘storytellers’. Each of these ‘storytellers’ provides you with a different form of gameplay, from the beginner-friendly Phoebe Chillax to the middle of the road Cassandra Classic, and the all-bets-are-off Randy Random. What you pick at the start of the game dictates your play style throughout, and can have an impact on the random events and different occurrences throughout your playtime, rendering each experience unique. Once you’ve picked your storyteller, randomised your survivors and set yourself up with a landing destination – which varies from jungle to desert to ice biomes and beyond – you can begin the game, crash-landing on this alien world with only a few materials and weapons you were able to gather before the incident. From there on out, gameplay is a mixture of survival strategies – for instance, hunting wild animals for meat or farming the land to prepare for winter – and building. Both to create shelter for your new colonists and provide defence against hostile enemies, which can range from vicious tribal warriors to crazed wild animals, or even evil alien robots hell-bent on destroying your colonists. One of the joys of Rimworld is watching your game evolve from your few settlers, with their dwindling food supplies and little resources, into a bustling, functional base that’s safe(ish) from the outside world. You can go full-on warrior clan, invading other AI’s bases and building up a considerable armory, or you could opt to be the best farmer on the Rim with an army of chickens and pigs set to sell to the next trader that wanders on by. Sometimes it can feel like it’s an uphill struggle to get the point of success, but once you’re there – and sitting on a mountain of uranium, mind-altering drugs and chilled steaks – it’s well worth it. A large part of what makes Rimworld unique is the unique way in which it connects with its audience – even though the game is relatively minimal when it comes to graphics, there’s a vast and busy Reddit and forum community of fans each telling their stories about their individual colonists and settlements, some of which they’ve worked on for months and are still enjoying to this day. 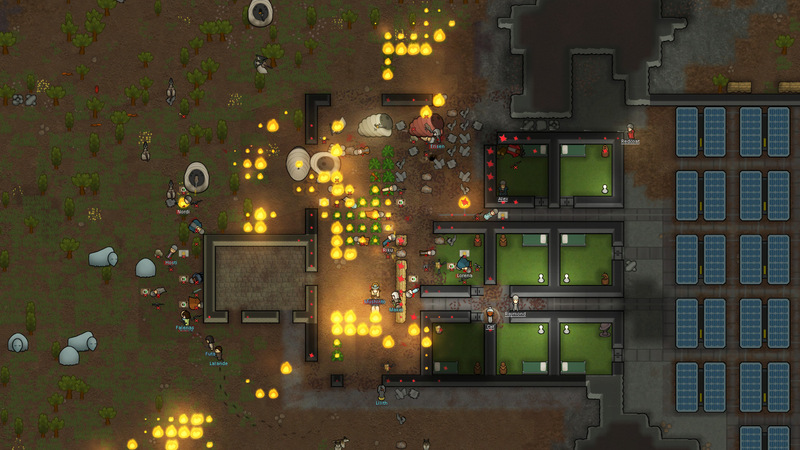 This connection, and the very active and inclusive nature of Rimworld’s developer, Tynan Sylvester, in his self-made community, has not only made Rimworld a best-selling game. It’s also made it one of the best-modded games out there, with mods for just about anything you could ever want available within Steam – with fans creating anything from unique, alien races to play to the addition of shiny new weapons, quality-improving tools and even mods that completely change the course of gameplay. For those who are a fan of in-depth, micro-managing simulation type games, Rimworld will no doubt be a hit with you. Overall, it’s Rimworld’s commitment to supporting fans and mods, and the inclusion of their fanbase and community in anything from Alpha and Beta testing to game-changing decisions, is a large part of what has made it a success in the eyes of its community, and why gameplay can still feel fresh and new thousands of hours later. Some of the only issues with Rimworld relates to its art style, which is highly simplistic and certainly not everyone’s cup of tea – though there are a few mods to change this and that as you wish. Rimworld is also relatively mature in its Beta build, but there have still been a few frustrating instances of lost gameplay files or corrupted sessions – though that’s to be expected with anything that’s as yet released, and par for the course with Alpha and Beta titles. Currently, Rimworld is available on Steam for £23.79, with the price soon set to rise to its full ‘launch’ price; so if you’re considering sinking your teeth into a meaty game that will provide you hours of gameplay fun with plenty of potential, do so now – you won’t regret it.